Remember to get the weather in your god damned book—weather is important. That’s what Ernest Hemingway wrote John Dos Passos in 1932. A century earlier, John Collins Warren already knew this lesson well. His diaries—fragile, yellow pages that look as if they had crystallized underneath a thick cover—always begin in the same way. In each day’s entry, written from 1844 to 1846, he specifies three crucial items: the temperature, the pressure, and the direction of the wind. On the morning of October 15, 1846, it was sixty degrees, with winds blowing from the West, Warren, a senior surgeon at the Massachusetts General Hospital, which he had helped found, spent an hour at the medical school at Harvard where he dismounted a Mastodon bone. After attending two important uterine cases, Warren went to Brookline to attend to his greenhouse, possibly to pick a variety of delicious pears and berries. That night he went to sleep very late. This day would be of no relevance were it not for the fact that it precedes the next. October 16, 1846, hailed a happy hour: on that day pain was conquered at the top of the Bulfinch building, at MGH, in the city of Boston. This round room was later christened the Ether Dome, a room that earlier filtered the horrific cries of the unfortunate, subjected to surgical procedures without anesthesia. Some surgeons at the time still regarded surgery as an inferior part of their profession, and themselves as little more than armed savages—a remnant of the previous century when country practitioners, if lacking their usual instruments, did not hesitate to sharpen a cheese knife and borrow a carpenter’s saw to get through an amputation of an arm or a leg. Some patients, worn out by desperation and fear of surgery, committed their own deaths. Others, such as veterans of the Napoleonic campaigns, refused to subject themselves to any comforts—what they called the refuge of cowards—choosing pain over comfort proudly. In 1789, a physician named Ebenezer Hunt subjected himself to the operation of a cancerous tumor near his ear by Dr. John Warren, father of John Collins Warren, without any painkillers, bearing every stroke of the knife while sweating profusely down his cheeks but never uttering a shriek nor even flinching. Such was the reason that would have made October 16, 1846, a memorable entry in Warren’s diary. On that day, he probably underwent the services of his barber for half an hour, as was customary. Dressed in his “colored” coat with metal buttons, a waistcoat, boots, and long breeches—daily cleaned—he probably would have arrived at the hospital early to prepare for his operation, the first surgical operation to be performed under the influence of sulphuric ether. Warren had been approached by a dentist named Morton with the request that he try an operation using a new anesthetic preparation he had supposedly discovered. Morton said this mysterious substance, when inhaled, allowed a surgeon to “regulate at pleasure” the time at which a person remained asleep. Warren, having been assured that the vaporized liquid would be harmless, agreed to employ it in the operation of Gilbert Abbot. To the surprise of Warren and the other gentlemen present, the patient didn’t shriek, although at times he did move his limbs and is recorded to have uttered “extraordinary expressions” indicating pain. Upon waking up, however, the patient assured everyone he had not felt any pain at all. On October 16, 1846, it was sixty degrees and the wind was coming from the south. That morning Warren went to the Medical College to make experiments on the renovation of decayed bones with glue. In his diary entry he describes in two sentences the most agreeable properties of such glue. He records the operation he later performed in two more. He calls it “interesting,” and doesn’t say more. 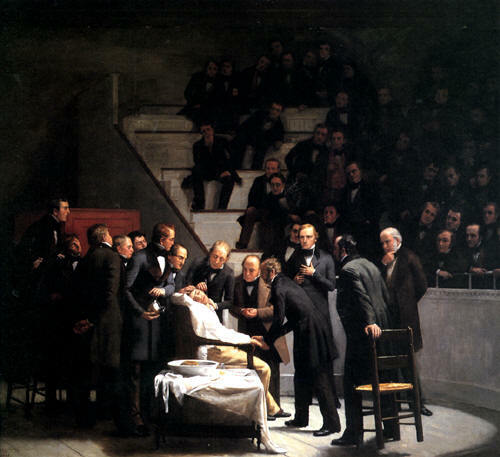 Essay originally published in Bulletin of Anesthesia History and MIT Scope.